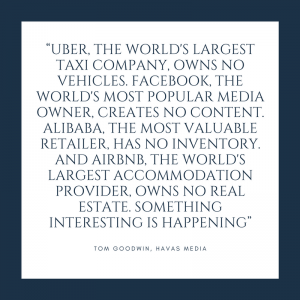 In the Digital Age we are so connected, the consumer is gaining the power over the organisation and the cost to serve is significantly decreasing, while the pool of customers is significantly increasing. These factors together are the perfect recipe for digital disruption. People are smart and artificial intelligence is getting smarter, data analytics is becoming more powerful and as such people are developing ideas that mean traditional business models are not meeting the expectation of the customer. United Focus can help you to identify potential areas of disruption to you business, assist in planning for disruption or explore how to manager disruption. We concentrate on what the customer needs are. At the end of the day – if you aren’t doing what the customer wants, then you become irrelevant. Product/service offering – New service and product offerings are available. How is your organisation keeping up with the needs and wants of the customer? Is your scale appropriate for you? The customer – there aren’t many industries left where the customer is localised. A shop once upon a time could only sell to the local surrounding suburbs – now potential customers exist around the globe from Argentina to Zambia. Risk – new risks are emerging and they are becoming more complex as we progress into the Digital Age. Traditional risk models are often now meeting the needs of organisations. Internal processes – traditional business processes are manual and expensive. The internet, artificial intelligence, data analytics and automation are changing internal processes to decrease costs and improve efficiency. Policy and regulation – many policies and regulations were developed pre the Digital Age. Many of these need to be reviewed and replaced to suit changes in the way people are doing business. How can we the tax office monitor and enforce tax payments with Blockchain?